Have you had Your Peaches Today? Another great component of a peach is the amount of fiber it contains. Fiber is great for our digestive tracks and helps our body’s process food correctly. A healthy amount of fiber in your diet contributes to keeping your body regular and serves as a ‘cleanup crew’ for your colon. So, next time you are roaming through the grocery store aisles trying to come up with the perfect snack for your family, pick up some peaches! Not only do they taste great. But, they will also provide your body with many vitamins and minerals that you need to remain healthy! 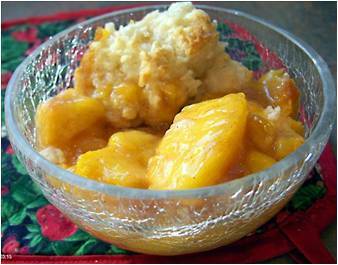 In a large saucepan, combine peaches, 1/3 cup of the sugar (5 1/3 tablespoons), cornstarch, lemon juice, and cinnamon; toss to coat peaches. Set pan over medium heat and bring to a boil. Cook until mixture thickens, about 1 minute. Remove from heat and transfer mixture to an 8-inch square baking pan. To make the topping, in a large bowl, combine flour, remaining tablespoon of sugar, baking powder and salt. Work in margarine with a fork until mixture resembles coarse crumbs. Add milk and stir until flour mixture is evenly moistened. Drop 8 tablespoons of topping mixture onto peach mixture. Bake until topping is golden brown and filling is bubbly, about 20 to 25 minutes. Ours too Laura! Such a great fruit!